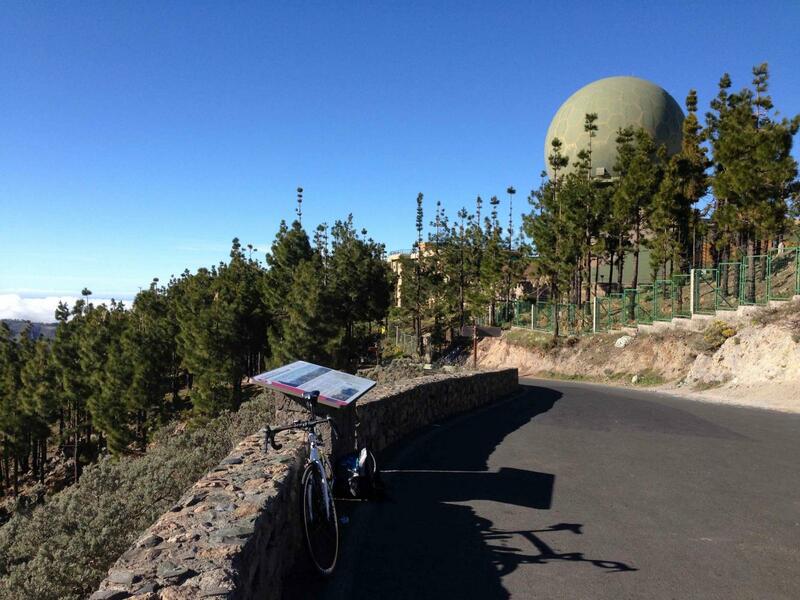 Gran Canaria's most difficult bike climb. Prepare for your journey by reviewing the gradient profile. Find out which part of the climb will be most challenging. Prepare for your journey with our interactive map below. Explore the route with streetviews, photos,videos, weather reports as well as browse other routes in the area. Cycling Pico de las Nieves from Telde - a World Top 100 Bike Climb. Ride 26.6 kilometers from 175m to 1933m gaining 1785m at 6.6% average grade. Summary by PJAMM’s Ron Hawks. This climb, which starts on GC-131 in the city of Telde, merges into GC-130 after a few miles and takes us to the highest peak in Gran Canaria. Telde is the oldest (founded 1351) and second most populous city on Gran Canaria (pop. 102,170) The spiritual center of Telde is the Church San Juan Bautista, located in the town square at the northern end of town, founded in 1483. Traffic at the beginning of the climb was steady but manageable and the road in good condition. However, once we merge onto GC-130 at kilometer 6.5 (at the 2 hairpins) the road quality declines and was fairly rough by Gran Canaria standards. The grade was pretty stout throughout the climb (steepest kilometer 12%) with a lot of double-digit sections that got our attention as we looked for decent tarmac to ride. We are in forest and the road bordered by Canary Island pines for a good part of the ride. About 18 kilometers into our ride we have our first and only respite with 2.1 kilometers that are effectively flat (0.7%). We get our first relief from a short descent that takes us past a beautiful viewing area formed by volcanic cauldron that’s worth a peak before the final ascent to the top. Caldera Los Marteles Viewpoint - kilometer 20. Once we turn left and head south on GC-134 (km 25), the great tarmac returns for the last 1.7 kilometers to the top. The parking lot at the top is adjacent to a military base with a large green ball-shaped radar. “Pico de las Nieves is the highest peak of the island of Gran Canaria, Canary Islands, Spain. Its height is 1,949 metres (6,394 ft) above sea level. The origin is volcanic (stratovolcano). On its slopes, Canary Islands Pine was reintroduced in the 1950s. It is the highest elevation of the province of Las Palmas and the third highest mountain in the Canary Islands. Of the other Canary Islands, only Tenerife and La Palma have higher peaks. All material copyright protected - may not be used for commercial purposes without permission of PJAMM Cycling.